This post is by Dr. Julie Gorte, a member of the Endangered Species Coalition Board of Directors. Throughout most of human history, Nature was a place that was by turns helpful, scary, dangerous, and unknown. We know a lot more about it now, but not enough, apparently, to remember that it is what sustains us, and that protecting its value is in our economic interest, not to mention just simply sensible. 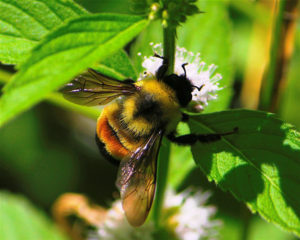 The Administration has recently suspended a rule that would make a species of bee, the rusty-patched bumblebee, an endangered species, and that would mean that we are legally obliged to protect its habitat. I’m going to create a trans-species metaphor and mention that this bee is a miner’s canary. Bees are pollinators. Pollinators do jobs that most humans can’t, or when they can it’s laborious to the point where our population would not be supportable if we had to replace the humble services of animals that move pollen from plant to plant, allowing them to grow and reproduce. Hey, but this is just one small species, and it’s already endangered. Can’t we afford to do without this one? That’s dangerous thinking. We don’t know enough about the functioning of natural ecosystems to understand the exact tipping point that renders a previously healthy system a failing and frail one. But we do know that pollinators are disappearing, or threatened, all around the world. What’s happening to the rusty-patched bumblebee is not an isolated instance of “oh, too bad.” It’s a symbol of a much wider problem. Many native bee species are “sliding toward extinction,” according to a new report from the Center for Biological Diversity. That decline is alarming at many not-intuitively obvious levels. Loss of pollinator services could exacerbate malnutrition and vitamin deficiency, and substantially lift the incidence of preventable diseases globally. The first rule of intelligent tinkering is to save all the bits. Delisting endangered species without solid analytical reasons to do so, and for that matter dismantling the protections of the Endangered Species Act, qualifies as unintelligent tinkering. One of my friends once decided, in the vortex of a curiosity whirlwind, to take his family’s air conditioner apart to see how it worked. He had every intention of putting it back together. He was, however, 12 years old, and being a normal 12 year old didn’t pause to label and catalogue every piece that got loose. He also lived in Phoenix. It was also July. It turned into the start of the worst week of his life. The first rule of intelligent tinkering is to save all the bits. Delisting endangered species without solid analytical reasons to do so, and for that matter dismantling the protections of the Endangered Species Act, qualifies as unintelligent tinkering. It’s fun, maybe, for some to caricature people as bunny-huggers for wanting to protect Furbish louseworts and snail darters, but when we think of these things as integral parts of a finely tuned machine, it changes the calculus. These pieces have a great deal of value as parts of a working machine. And occasionally, we find that they also have other economic value as themselves: the compound Taxol, which has been used to treat advanced ovarian cancer, came originally from the bark of the Pacific yew, a threatened species; the drug can also be made with yew species from the Himalayas, but it too is considered endangered. There are many other examples of specific contributions to economic value that were developed in nature’s R&D lab. And it’s also worth mentioning that every one of them is part of an ecosystem that depends on many other organisms and natural systems—like clean water, soil, and air—to thrive. The planet’s health and our economic well-being aren’t two separate things, and they’re certainly not antagonists. If we think of them that way, and view environmental protection solely as a crimp on short-term pursuit of profit, we’re taking apart the air conditioner on a hot day in Phoenix.